Is it Monday already? Seriously, how do the weekends go so quickly? I hope you had a great weekend! I enjoyed some down time on Friday and Sunday and saw some friends on Saturday. My work week was also pretty great, so I'll kick off sharing my week via Instagram with it. 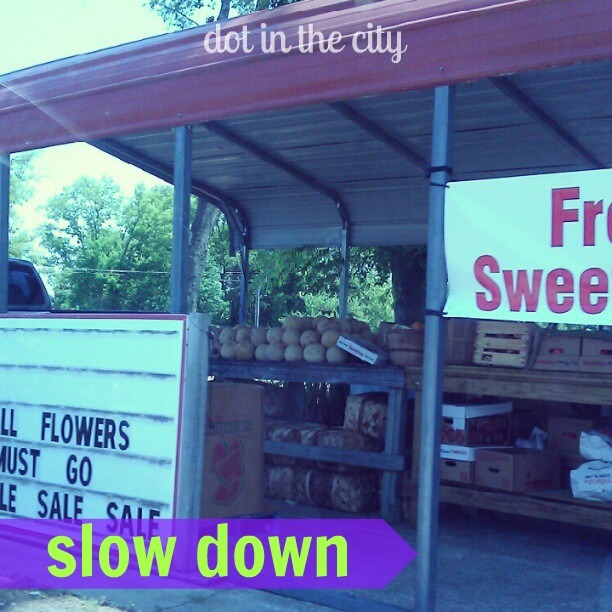 A few shots while I wasn't exactly workin'...I love the slower pace of my job in the summer. Don't get me wrong, it's not always slow. The campus center is certainly more quiet this time of year, with fewer students around. On Tuesday, I drove to a meeting in Rhode Island for work and Thursday we had a surprise shower for a colleague. And who doesn't have a few moments during the week that just make you smile? 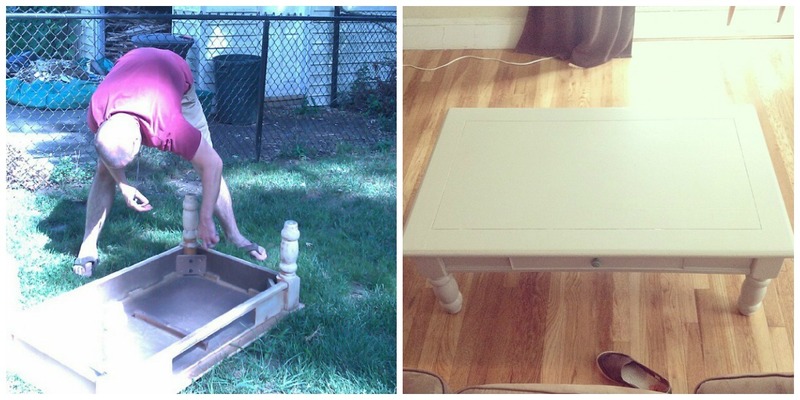 About a month ago, we found a coffee table on the side of the road. I made my husband turn around so we could check it out and we ended up putting it in our car to take home. I loved the shape/size of it and knew a little paint would give it new life. Last week, Brandon sanded it and used his new power painter (a birthday gift) to do just that. It totally brightens our living room! On Saturday, I took a day trip to Maine with colleagues. We all work at different colleges in similar roles, so it's fun to get together for a BBQ. After we ate, we drove a few minutes down the road to the beach to take the dog for a walk. As you can see, she loved it. 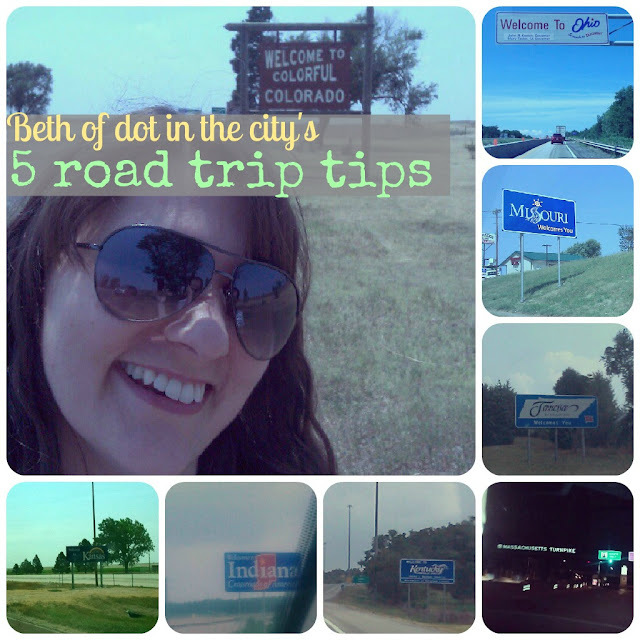 I'm linking up with Molly for #YOLO Monday and Brooke for InstaLife! Happy Friday! I feel like this past week flew by, how 'bout you?! 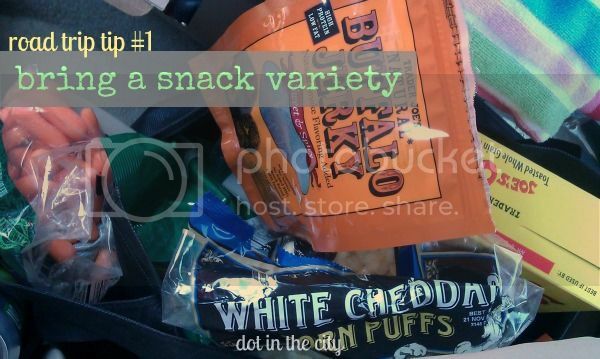 I'm excited to share some of my favorite blogs posts and internet finds of the week, but first I want to share a quick story. 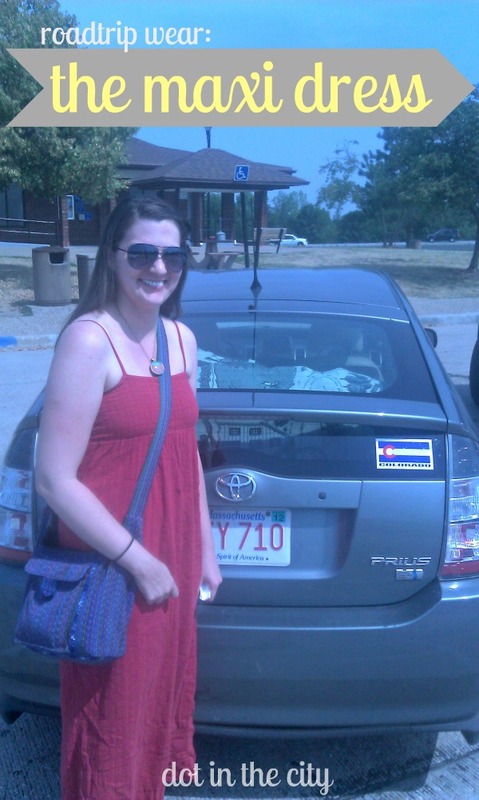 We own one car, a 2005 Toyota Prius and we love it so much we drove it to Colorado on a road trip earlier this summer! So, when my husband called me just minutes after leaving the house to drive 20+ miles to Boston for his Thursday night class and said "there's something wrong with the car," I froze. All I could respond with was "are you okay? What happened?" He explained a rather ominous light appeared on the car's screen and he read in the owner's manual the message meant the car had to be taken into a dealership. My heart sank...we just can't afford another bill. We agreed he would go to Advanced Auto Parts to see if they could run a free diagnostic test to determine if it really needed to be taken to the dealership, while I would do some online research to see if other Prius owners had shared their experiences with the ominous red triangle with an exclamation point. I want to say I sat and prayed without distraction while waiting for him to get home, but that's just not true. I continued to read what the possible issue could be, realizing it was likely the battery or water pump would need to be replaced. Neither of these had much meaning to me besides the $$$, alongside it being our only car. I was doing my best not to panic and did manage to ask God to provide. All of which to say, the inverter (water) pump needs to be replaced, but we found out there is a recall from Toyota on 2004-07 Prii (is that the plural of Prius?) so that means we will be getting it repaired at no cost (insert sigh of relief here!) Oh, why do I doubt? 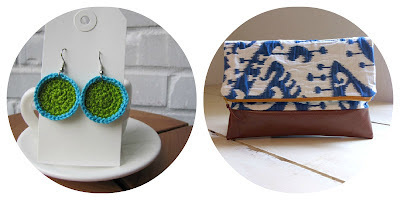 >>Not one, but two new Etsy shops from two dear blogger friends! Just in case you missed it on Instagram or Facebook yesterday, I wanted to mention August advertising spots are open. This means you can buy your own piece of real estate over there --->>> and get frequent social media shout outs (and more). For full details, read more. 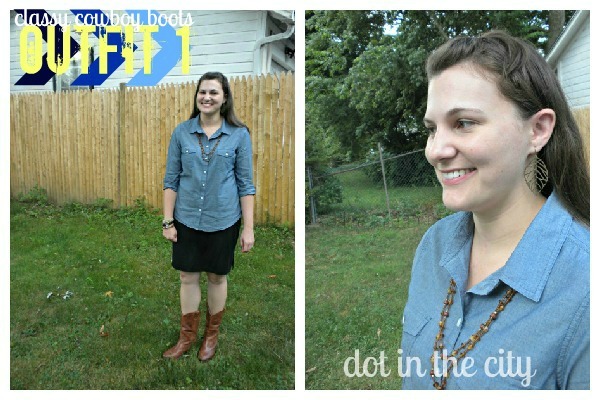 I'm linking with Erika for Friday Finds & Favorites. This morning, while I was catching up on yesterday's #SheReadsTruth passage, I started thinking about how familiar this verse is, yet how much I struggle to make it reality. I desire them all, but need God to put a new desire in my heart with each new day. 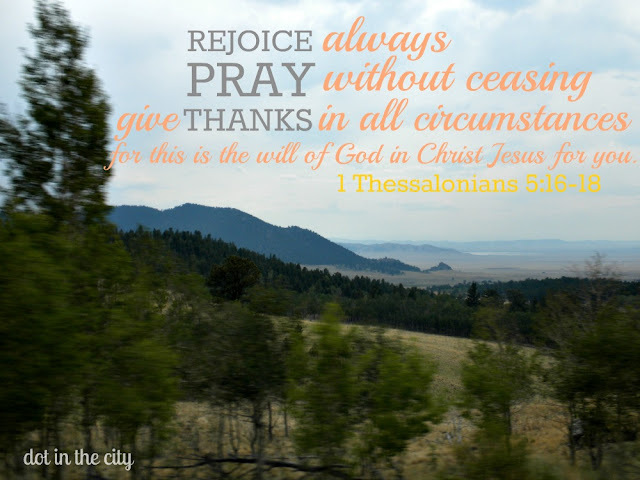 >>>I need to find my JOY with Christ, instead of getting joy from putting together a cute outfit or the amount of money I save from coupons/sales while shopping. It's not wrong to be excited for those things, but it isn't honoring God to get my joy from them. >>>I need to PRAY more, to seriously sit down and give God my undivided attention. 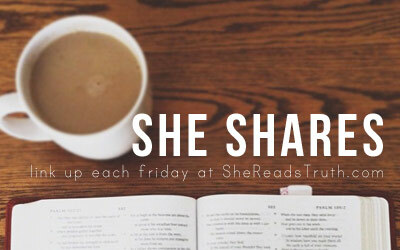 Put away the distractions of technology and just sit in His presence and pray until I pray, as Raechel reminded us when the current SheReadsTruth study began. >>>I need to give THANKS to the One who created me and knows me better than I know myself. He totally gets my circumstances and provides for me in ways I don't often acknowledge. 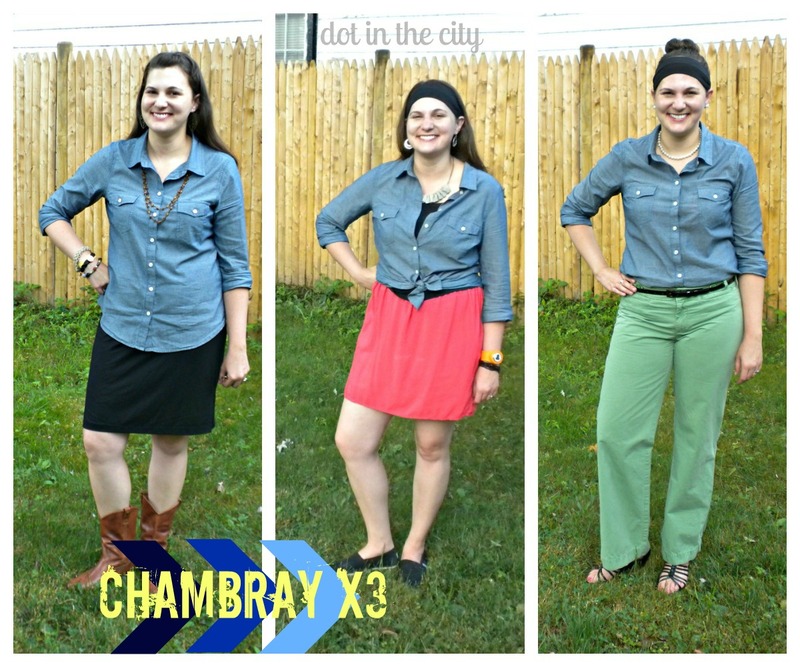 I have had my eye on the chambray shirt trend for several months. I found one online at Old Navy, but it quickly sold out (similar). I turned my search to local thrift shops and eventually found one and wore it a few times. But honestly, the bow wasn't me. About a month ago, I was in an Old Navy store and came across their chambray blouse on the rack! I ended up paying $17 with a 30% off coupon and it was worth every penny!! I've worn it at least once a week ever since I bought it (and possibly two days in a row). I call this my Tammy Taylor look (anyone else watch Friday Night Lights and get outfit inspiration from her?) I have had these boots for two years, but rarely wear them. They're not quite the norm here in the Northeast, but being married to a guy who grew up outside Nashville and having lived in Colorado, I do my best to embrace the western wear. I was seriously so comfortable wearing this outfit to work. 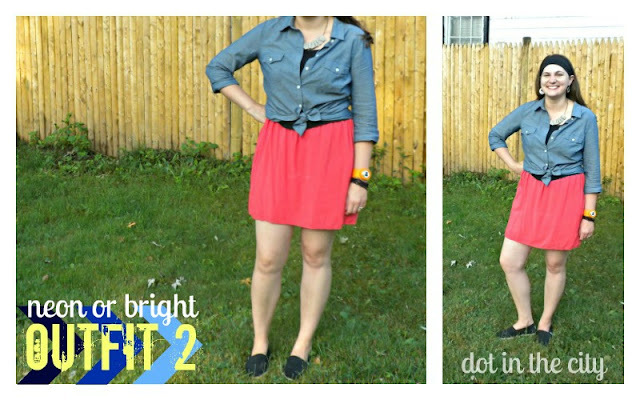 I wanted to incorporate something bright or neon in this outfit. Neon is a trend this summer and having grown up in the 80s, I really can't bring myself to buy anything neon. The watch is the closest thing to neon I currently own (it was a freebie my colleague brought back from SXSW). The dress (I disguised it as a skirt by layering a black tank over) was a sale rack score last summer and I usually wear it with leggings or as a beach cover up. Who owns bright green pants? I bought these about five years ago and actually took a lot of heat for wearing them (at the time, my job required I wear a black polo with khakis, so I bought a few pairs of colored khakis thanks to Old Navy and J. Crew). I like the unexpected combo of pearls with a pair of pants most people don't own. What trends do you love wearing this summer? The thought occurred to me as I was driving home from work yesterday, how am I going to watch the Olympics since we don't have cable? I don't know why it hadn't hit me already, but our experience of the London 2012 Olympics will be much different from those of past Olympics without a direct (cable) line feeding it to our television starting on Friday. 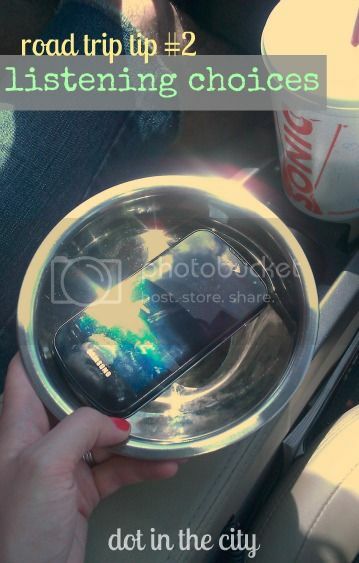 The good news is that there are plenty of ways to follow along thanks to today's technology. The tele (as they say in London) is no longer the sole nor even main source of information about the Olympic Games. A google search yields all kinds of results ranging from the official website to broadcast networks to sponsors like Coca-Cola, among other brands. 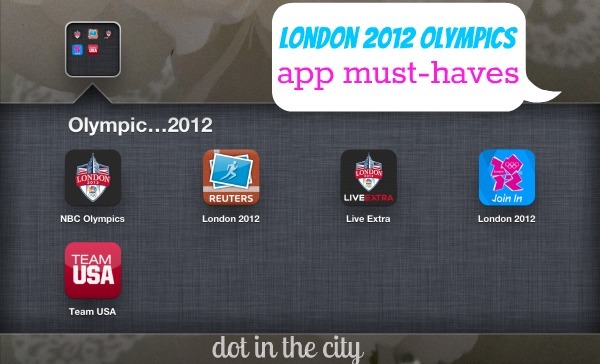 I also did some research to see what apps are available to follow the Olympics and I came across quite a few. Since I have an iPad, I decided I should take the London Games as an opportunity to realize its full potential (apps highlighted below are specified if only available on Android OR iPhone devices, otherwise available on both). London 2012 (free, for iPhone) The official mobile app of the 2012 Olympics is full of interactive screens that will allow you to peruse the schedule, events, maps and more. Favorite your sport(s) of choice and filter results to keep up with the team(s) you want to follow. Reuters London 2012 (free, for iPhone) Features photos from award winning photographers (bios included) and everything is laid out in a timeline to show chronological order. This will be a place to look for amazing photos to follow the Olympic highlights. NBC Olympics (free) Features live updates, news results, TV/online listings, medal counts, and more. It makes it easy to engage with your favorite athletes through Twitter and Facebook. NBC Olympics Live Extra (free) Taking it a step further, you can watch live coverage of the Olympics on your handheld device if you have a cable TV subscription. Without a cable subscription you cannot login to access its full features. A limited amount of content including event replays will be available, but basically all that is already on the previously mentioned app and NBCOlympics.com. Team USA (free, iPhone or Android) Full of trivia about Team USA (facts rotate on the opening screen), you can learn the latest news, event schedule and even shop (How American is that?!). In the days leading up to the Olympics, they feature a different American athlete. You can also link up with Facebook and Twitter to share articles/images. I have to say, my favorite app thus far is the London 2012 because of the maps of the Olympic Village and ease of navigating from one thing to the next. I will also use the NBC Olympics app a lot since we don't have cable. I was pretty disappointed to see you have to be a cable subscriber to benefit from NBC Olympics Live Extra...I guess ad space will only get you so far. 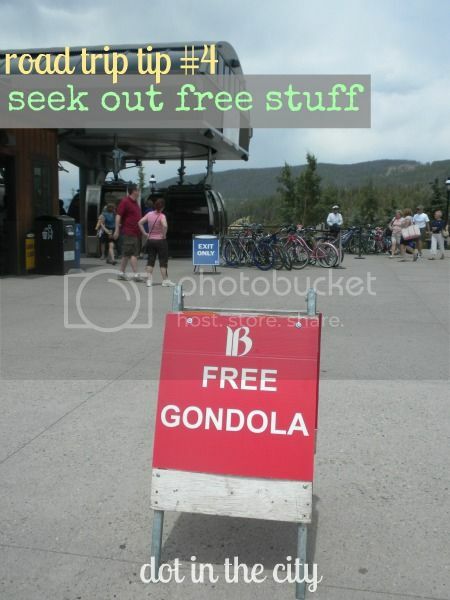 And be warned, each of these apps has some kind of pop up/banner ad running, but they are all free. The Olympics will be here before we know it (just three days)! The world will listen, watch and follow from more devices than probably ever before. How will you be keeping up with it? I'm pretty sure I'll end up keeping tabs via Twitter and the usual news outlets I visit online or listen to on the radio. If you have any ideas for tracking the Olympics I've overlooked, please share! 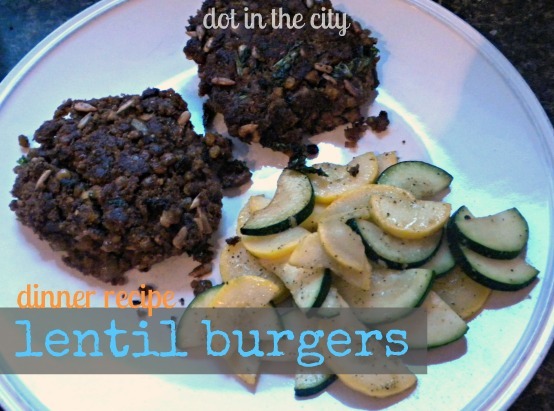 I recently started getting Outside Magazine, and came across a recipe for lentil burgers. I love a hardy burger, don't you? But we've been eating a lot less meat, so these burgers made from lentils and mushrooms (and lots of other yummy ingredients) seemed worth the try. In true Beth fashion, I improvised based on what was in the cupboard and our tastes. My non-vegan recipe is shown below and you can check out the original vegan recipe. In a medium size pot, bring 2 1/4 cups of water to boil, then add lentils, 1 minced garlic clove and 1/4 cup chopped onions. Simmer for 20 minutes (or until lentils are tender and the water is absorbed). In another bowl, combine sunflower seeds, bread crumbs, and ground flax seeds. In a different pan greased with olive oil, saute 1 cup chopped onion, 2 minced garlic cloves, chopped mushrooms and finely chopped kale for 8-10 minutes. Remove lentils from heat, add dijon mustard and balsamic vinegar and mash ingredients together. In a large bowl, combine lentils, sauteed vegetables, bread crumb mixture with 2 eggs. Cool in refrigerator. Using your hands, form patties and fry in vegetable oil until lightly browned and crispy on both sides (about 3-5 minutes on each side). Serve on toasted bun or on their own. Makes 8 burgers. 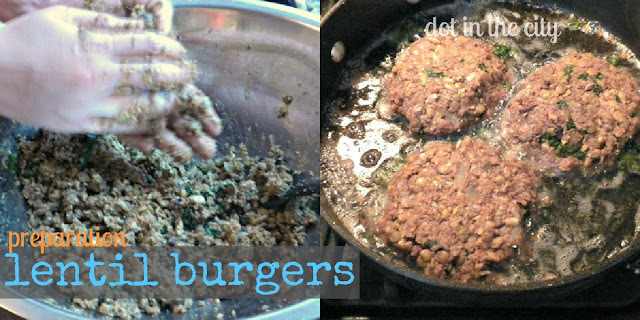 Do you have a favorite burger recipe? 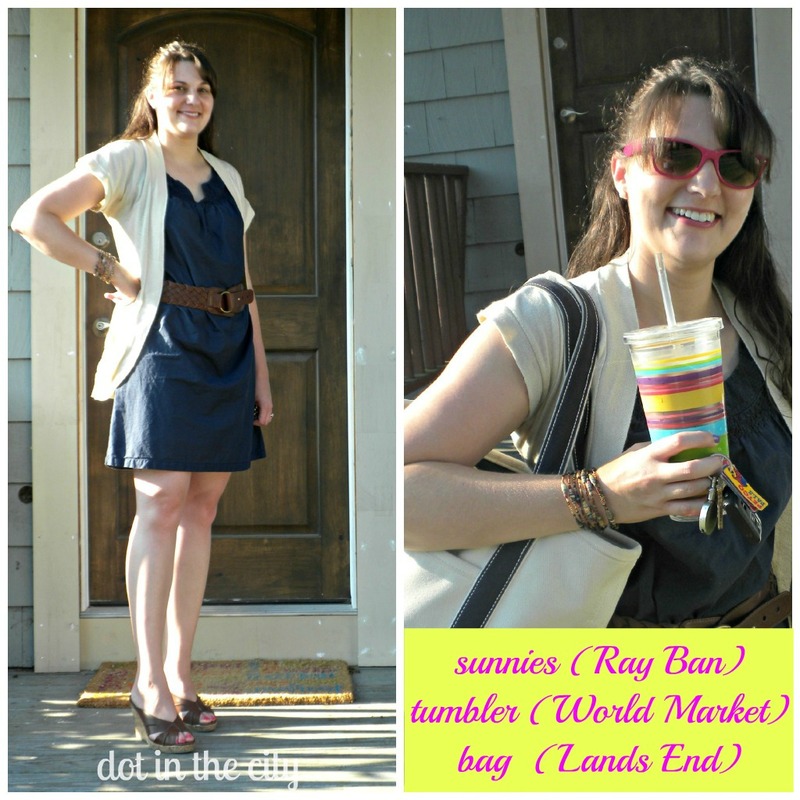 I'm linking up with Molly for #YOLOMondays. 1- #ootd ((chambray, plaid shorts)) 2 - #SheReadsTruth time 3 - sunning myself while watching the dogs 4 - summer influenster beauty voxbox 5 - enjoying a serious rain storm 6 - morning view: more #SheReadsTruth and my breakfast ((can you tell I love that coffee tumbler from World Market?!)) 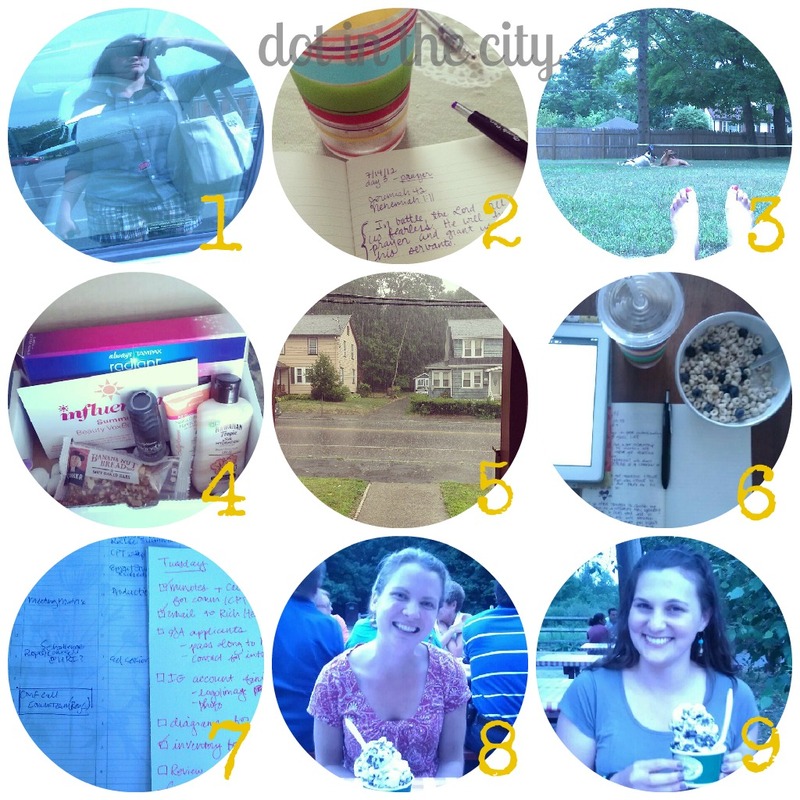 7 - list making at work 8 & 9 - ice cream date with Carrie, a friend I've known for 15 years! DIY idea I can't get out of my head: denim jacket turned vest. Is 31 too old to wear this? Have you heard of IFTTT? If not, read Cam's post that breaks it down. looking for ideas to promote you shop or blog and connect with others? As for social media, I'm pretty addicted to Instagram! I feel like it's more personal, sharing photos from everyday life, and I love the community I have there. I try not to spam my feed with too much blog/shop updating, but if I do have a good sale or great post, I like to share a picture with that info, and I feel like it gets the word out to people who care. ;) You'll find me on IG as @thesweetpetunia! My favorite form of social media is a tie between Twitter and Instagram. I love how both are immediate and quick. I have made awesome connections on Twitter and always have fun browsing Instagram. 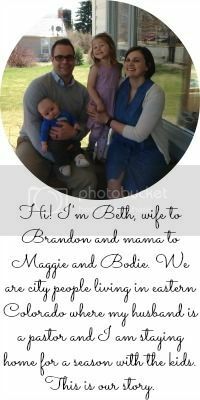 I love how people share personal photos and I have started to feel like I "know" some of my blog-ey friends. You can also connect with Gina on Facebook. I have definitely found the most success in using Twitter to promote Jac & Elsie. I see other shops have a ton of success with Facebook, and I'm wildly jealous, but for me, Twitter all the way. I think it's because I follow people who tweet about stuff that interests me, like autism. And for my fundraiser pieces especially, Twitter has been a wonderful source of sales, including one of my larger wholesale orders for a batch of autism necklaces and bracelets. Also, you can never underestimate the value of a retweet. Etsy has retweeted me twice, and holy cow, the response from Etsy users and lovers was stupendous! I have found that Twitter is most successful when used to simply tweet about stuff I'm doing. Something about, "Oh man, I'm so happy with the new pieces I just listed in Jac & Elsie" will garner so much more feedback than "Hey, check out these earrings!" No one wants to be bombarded with nothing but sales pitches. Something that can possibly garner a conversation will be met with much more success. This summer, I've spent less than $50 on clothing and accessories and this will be the first in a series about small wardrobe updates that can be made without a lot of money. 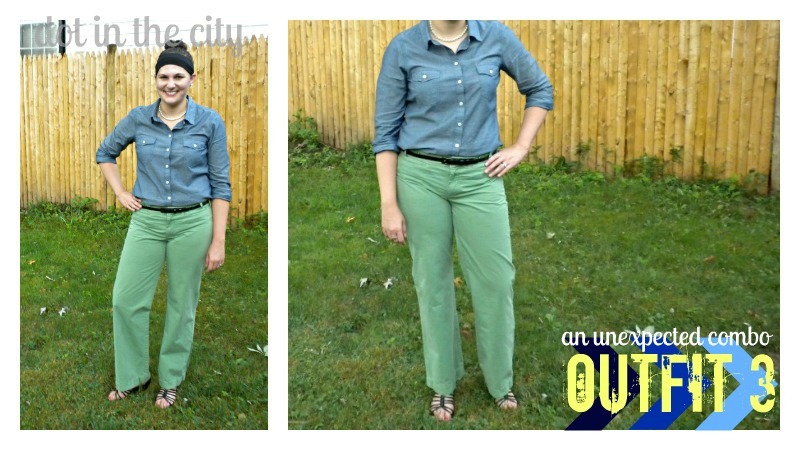 After reading The No Brainer Wardrobe last fall, I have been more contentious about how I update my look (you can read my review of the eBook). I try to find pieces that can be worn with multiple outfits (i.e. shoes) to go with the staples I already own. 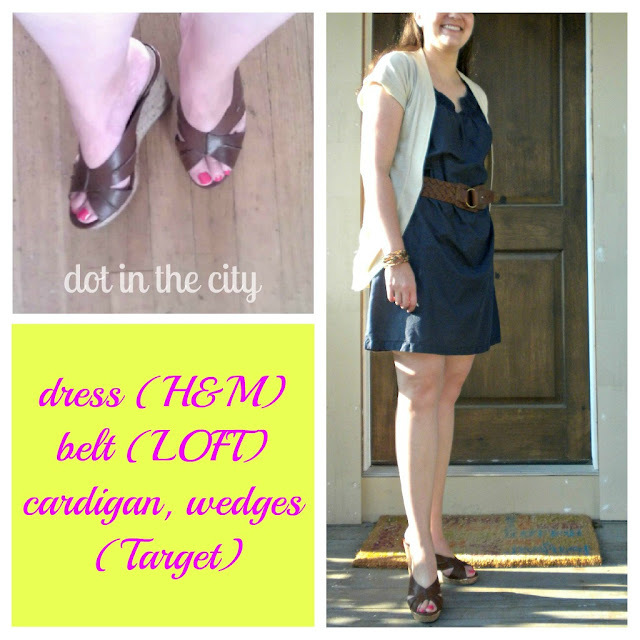 My first example are these wedges I practically stole from bought at Target for $7.48. Crazy, huh? I was most excited to see how the wedges matched a belt I already owned. This outfit was the first I had paired them together. I've worn the wedges with shorts and will wear them with jeans once it cools off enough. 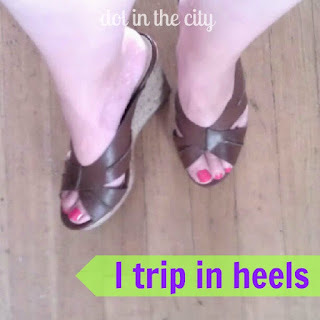 They're comfortable for heels, but if you were around here yesterday you may recall I have issues with walking in heels. 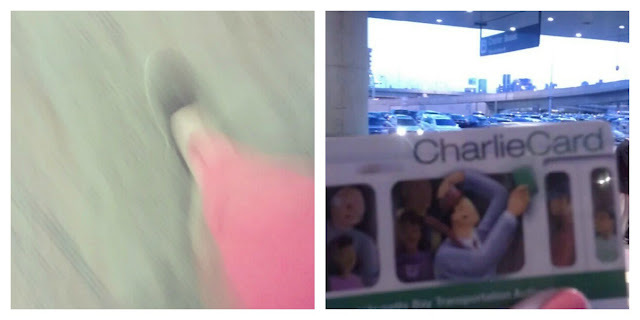 But I haven't given up and will continue to practice walking in them. Any suggestions? All right, are you ready for a confession?! I discovered Giuliana & Bill on Netflix last night and watched three episodes! I can't say it's my favorite, but it was entertaining since I cannot even imagine such a lifestyle (i.e. two homes...one in Chicago and one in LA). My favorite thing (so far) was the clothing swap that Giuliana threw. It cracked me up that she bought clothes for it...not quite like the clothing swap I hosted. I'm so grateful for the opportunity have lived in a few regions of the US (mainly Colorado and Massachusetts since high school) and then Baltimore for three years after grad school. I've picked up phrases like "y'all," "hon" and "wicked." Those are words that don't often find themselves in the same sentence, yet if occasion calls I just might say "I don't know about y'all, but my trip was a wicked good time, hon!" But deep down, I'm actually a bit jealous of my southern friends and relatives. They always look so put together and they have the cutest accents! I don't have an accent, which is probably why I pick up on using words like "y'all." I also appreciate their hospitality and pace. They ask me questions and make me feel like I'm the only one around, when I'm just going through the checkout line at the grocer. I could stand to learn a lesson from my southern friends like slow down and take the time to get to know those around you. I could give more than one example, but when we were buying peaches and a melon at a farm stand, the guy was so friendly. He acted like he had all the time in the world and he even taught me how to thump a watermelon to see if it's ripe or not! Northerners are often known for their hurried style, but I'm fighting against that lately. I am telling myself to slow down and enjoy each moment for what it is. If I'm with a friend, enjoy it. Even at the grocery store, I don't need to make it my objective to be checked out faster than the person who approached the checkout line next to me at the same time. Life isn't a competition. And maybe if I slow down enough, I'll be able to walk without tripping properly in my cute heels (because I own several pairs I rarely wear)! 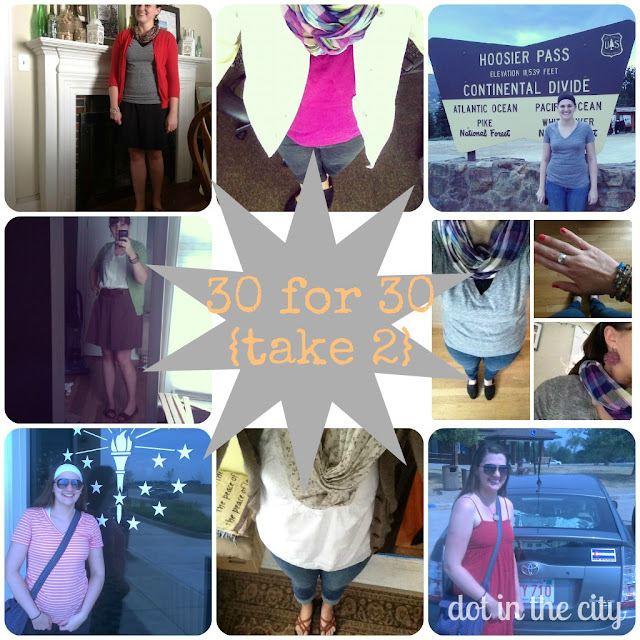 You may recall last month, I participated in the 30 for 30 challenge and posted my first 13 days. 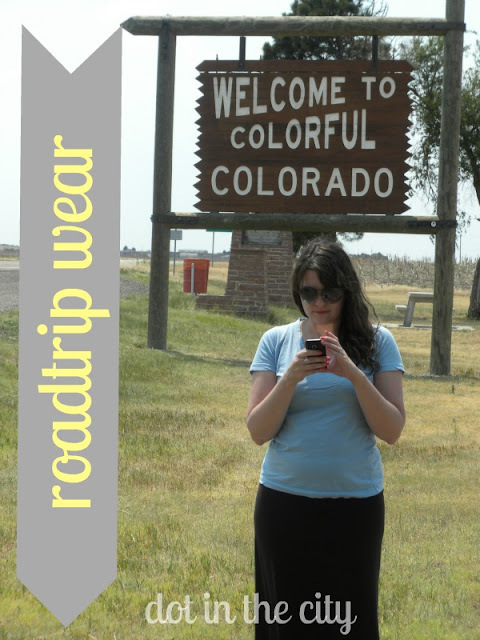 I have to be honest, I wasn't able to complete the 30 days with our three weeks of travel at the end of June/beginning of July, but I did incorporate several of the same tops and shoes into my outfits while traveling (see below). It was good for me to simplify a bit and I think doing the challenge in summer gives more options than fall. Have you done the 30 for 30 challenge before? I love making and eating a special breakfast over the weekend. 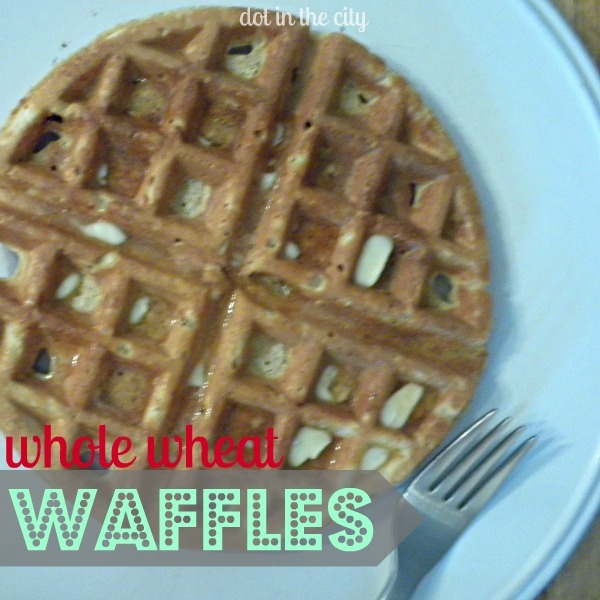 It usually consists of an omelet, but I recently found a recipe from the American Diabetes Association for whole wheat waffles. I made a few minor changes mentioned below. Combine dry ingredients, mix and set aside. Combine wet ingredients and add to dry ingredients, mixing completely. Coat waffle iron with nonstick cooking spray and allow to heat thoroughly. Serve with maple syrup and butter or as desired. Do you have a favorite waffle recipe? Blogging is all about connections, right? I love reading other's blogs and leaving comments and then getting to know another blogger through commenting on each other's blogs. Am I the only one? I have a feeling there are several loyal readers around here I don't even know. So, today is your chance to tell me who YOU are. I want to know a few things about you...will you indulge me and leave your answers in the comments? What do you do when you're not reading/writing blogs? Do you blog or tweet? If we met in person, where would you want to go/do? We've all heard it said before, 'comfort is key' and I think there's no time it matters more than when I'm traveling. As you may know, if you've been around here much lately, I've been away from home for the past two weeks (yes, I'm still on the road to those who follow me on Instagram and Twitter). 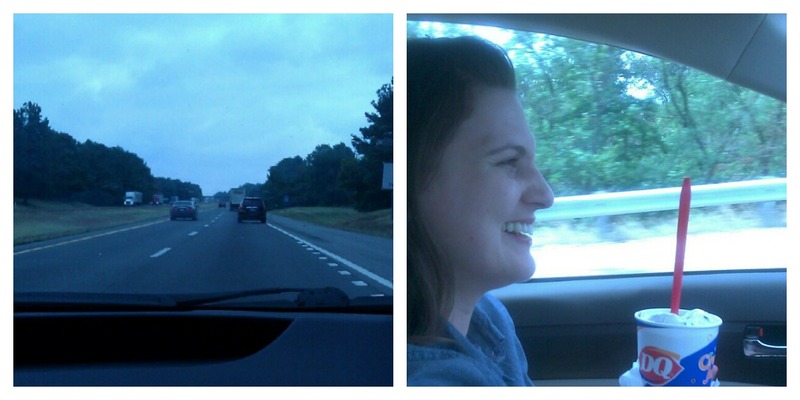 We've been traveling by car and have covered over 3,000 miles, needless to say we've been doing a lot of sitting. I don't know about you, but jeans are not my favorite thing to wear when I'm sitting for long periods of time. I suggest wearing something that's as comfortable as sweatpants, but cuter: the maxi skirt or dress! Look pulled together yet feel comfy! Do you have any road trip wearing secrets? Today, I have a treat for you, as I get to introduce Jaclyn and her handmade shop to you. Introduce yourself and your shop/blog. Howdy, all! I'm Jaclyn, AKA the "Jac" in "Jac & Elsie," an Etsy shop full of beautiful handmade, vintage and upcycled jewelry. I fully believe a little something pretty can turn around a day. I put a lot of love into everything I make, and I like to think you feel the same whenever you open a piece of Jac & Elsie goodness. How did you get started with your handmade shop? I was at a friend's house, and she happened to have all her beading supplies out. The pretty beads caught my attention and made my fingers itch. She taught me how to open a jump ring and work a crimp bead. And that was that. I started with primarily beaded pieces and started to list on Etsy because, frankly, there was no way I could wear everything I had made. My style of jewelry has grown immensely. I much prefer working with vintage pieces, pulling them apart, repurposing them, fixing them. And I have found something of a niche in affordable adult friendship jewelry. You're never too old to tell your best gal pal that you love her. Tell us one piece of advice for someone starting a handmade shop. Be prepared to spend most of your time NOT doing the thing that got you started with the shop. I opened Jac & Elsie because I love to make jewelry. But take this listing. The actual making of those earrings was the shortest part of the whole listing and sales process. The rest has been, and will be, taking photos, editing the photos, creating the listing, handwriting a thank you note to the buyer and packaging the earrings, not to mention the time it takes to market your site. Oh yes, and running to the post office should they find a home overseas. I feel so lucky that I enjoy the whole process, but I think opening a shop can be discouraging for people who don't realize all theother stuff that goes into their craft. What has been the most rewarding thing about having your own handmade business? Knowing that Jac & Elsie jewelry is all over the world! I've shipped to Australia, Israel, Paris, Italy and more. It is so amazing to think a piece I made in my little Indiana studio or found in a small-town Indiana antique shop could find a home so far from where it started. And now, for the part you've been waiting for! 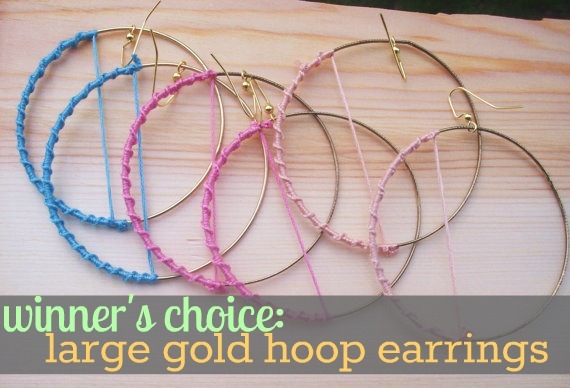 Use rafflecopter below for a chance to win ONE of three pairs of earrings, valued at $25.